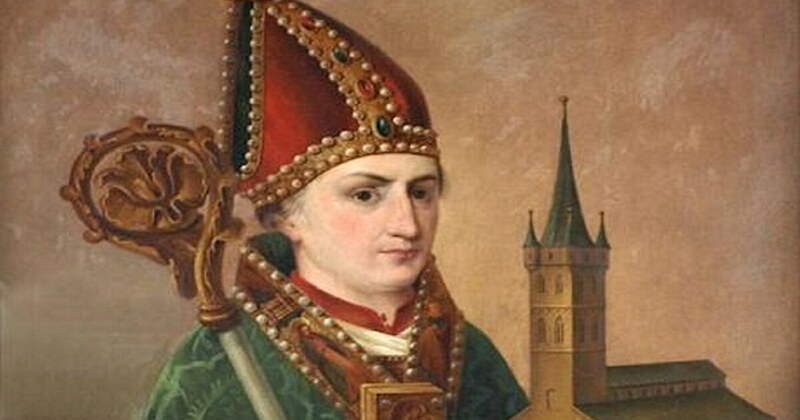 Saint Ansgar, Bishop - My Catholic Life! Today’s saint walked the forests of Northern Europe during that stretch of history later known, prejudicially, as the “Dark Ages.” He lived three hundred years after the fall of Rome and yet three hundred years before the soaring gothic spires of the High Middle Ages pierced the blue sky. “Ansgar” is a grunt or a mere sound to modern ears. It seems fit for a remote, cold, and brutal age. It is difficult to imagine a child running into the warm embrace of a sunny Ansgar. But the real Saint Ansgar broke bread with Northern Vikings and rough warriors of the forest with names just like his own: Horik, Drogo, Gudmund, and Vedast. Ansgar was one of them, with one big difference—he was a Catholic. The one thing, a very big thing, that links such long-ago saints, priests, and bishops to us moderns is the Catholic faith. We share the exact same faith as Saint Ansgar! If Saint Ansgar were to step out of the pages of a book today, in his bear fur covering and deerskin boots, and walk through the front doors of a twenty-first-century Catholic church, he would be at home. His eyes would search for the burning flame of the sanctuary lamp, and upon spotting it, he would know. He would bend his knee before a tabernacle housing the Blessed Sacrament, just as he did thousands of times in the past. He would walk past statues of Mary and the saints and know their stories. He would hear the same Gospel, make the same sign of the cross, and feel the same drops of blessed water on his forehead. Nothing would be unusual. Our faith unites what time and culture divide. The Church is the world’s only multicultural, transnational, timeless family. There is nothing else like Her. Saint Ansgar left his native region in Northern France, after receiving a good Christian education, to become an apostle monk to Northern Germany. He was named by the Pope as Archbishop of Hamburg and, from that post, organized the first systematic evangelization of Scandinavia. These regions were far, far away from the more developed civilizations of Italy, Spain, and France. Yet Saint Ansgar and his helpers traveled that far, and risked that much, to plant the Catholic faith in the frozen ground of what is today Denmark, Norway, and Sweden. Yet nearly all the seeds of faith that Saint Ansgar planted were to die in the ground shortly after his own death. Sadly, his missionary efforts produced no long-lasting fruit. The age of the Vikings dawned, and it would be two centuries before Christianity would again flourish and spread across the northern arc of Europe. Yet even that second evangelization would come to a bitter end! In the sixteenth century, Scandinavia abandoned Catholicism for its shadow under the influence of Fr. Luther and his followers. What a lesson to be learned! As Saint Paul wrote, one plants, one waters, and God gives the growth: “He who plants and he who waters are equal, and each shall receive his wages according to his labor” (1 Cor. 3:8). Saint Ansgar carried out God’s will. He labored for the Lord and for the faith. What happened after that was up to God in His providence. Carrying out God’s will should be enough for us, as it was for our saint today. We must plant and till, even though harvest time may never come. Saint Ansgar, you persevered in difficult times to bring the faith to a pagan land. You saw success and then failure, glory and then disappointment. Your work did not outlast you, but pleased God nonetheless. May we see our work as our duty, and our vocation as God’s will, even when the fruit of our labor is harvested by someone else, or not at all.